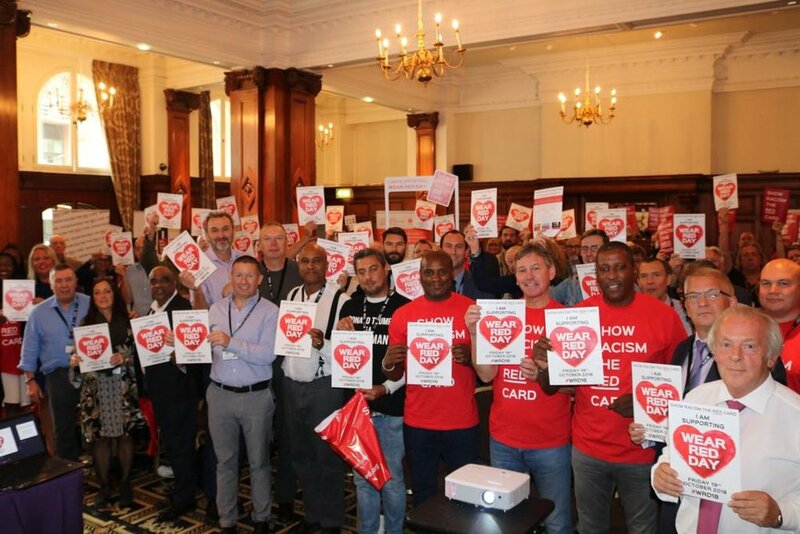 On Monday 10th September 2018, Show Racism the Red Card hosted a fringe meeting at the Midland Hotel, Manchester, for delegates from the TUC Congress 2018. Former Manchester United players, Bryan Robson and Viv Anderson, were joined by former Chelsea star, Frank Sinclair. All three of whom had given up their time to come along and listen to the fantastic line up of speakers and show support for Show Racism the Red Card. The meeting was chaired by TUC President, Liz Snape, who did a great job of keeping the event running to schedule. First speaking was Roger McKenzie, Assistant General Secretary of UNISON, who delivered an inspiring speech where he called on the delegates to take action post fringe meeting and support Show Racism the Red Card and Wear Red Day 2018. Next up was Howard Beckett, Regional Secretary of Unite the Union, who spoke about how he believes education is the key to fighting racism and that his Union will continue to support the organisation. He stated; “It’s all about education, fighting racism must be about education”. Gordon Taylor, PFA Chief Executive, was next to speak and he praised the organisation for how far it has come in its twenty-three-year history. Steve Cavalier, Chief Executive of Thompsons Solicitors, also spoke about why he supports Show Racism the Red Card and what the organisation means to him. Kevin Courtney, General Secretary of the National Education Union, explained to the delegates how the organisation use football as a way of speaking with young people about the topic of racism. And finally, Elizabeth Cameron, UNISON, finished off with a powerful speech about the racism she has faced in recent times and why she fully supports what Show Racism the Red Card do. This is the TUC's 150th year, and celebrations of this anniversary will form an important part of the TUC Congress in Manchester, 9-12 September. Congress is where the movement decides its priorities for the coming year, and what the TUC should do to achieve them. Each union sends delegates and raises issues for discussion and debate.